Working with fondant can be an easy alternative to cake decorating. It can also be combined with traditional cake decorating techniques to make great looking cakes. 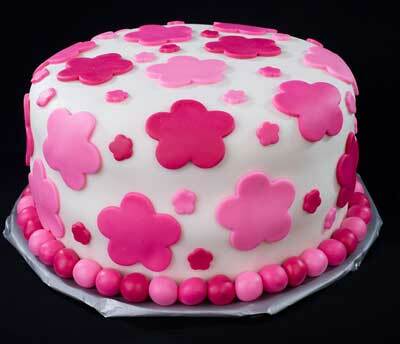 All you need to do is learn a few basics of fondant and practice, as everything regarding cake decorating. It can be a lot of fun once you get the hang of it! 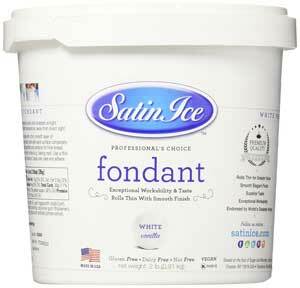 Fondant is made from powdered sugar, corn syrup and water. Flavoring can be added as well. 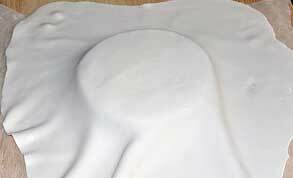 By covering a cake with this technique, you can give it a flat smooth surface. This method is like working with clay. It will form shapes, can be rolled out, cut with cookie cutters, twirled around wooden dowels to make ribbons and pretty much formed into whatever decorations your imagination comes up with. You can buy already made or make your own fondant recipes. 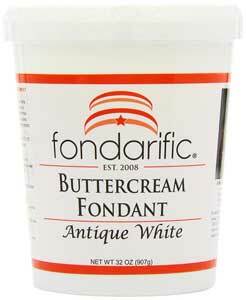 What kind of fondant to buy? If you have extra fondant when you are done decorating your cake store it at room temperature in a tightly covered container. Once you've decorated your cake it is best not to store it in the fridge as the icing will start to "sweat"
Now that you've learned what it is and you have your store bought or homemade fondant icing recipe done and ready, it is time to learn some basic cake decorating techniques and start working with fondant. 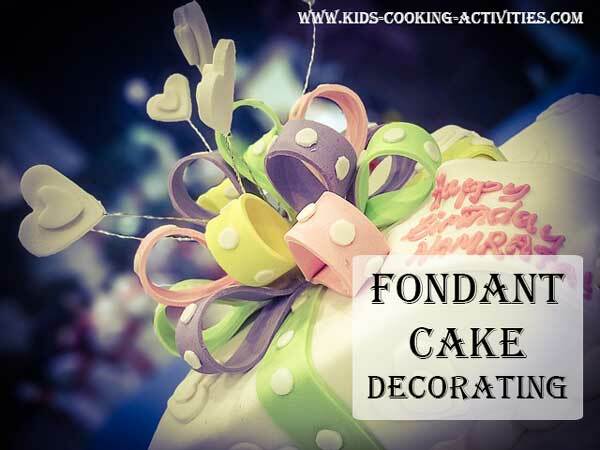 If you have colored fondant on hand as well as white, you can color fondant by taking a piece of colored icing and kneading it into the white. The trick is to continue to knead until all color is distributed. This may take a few minutes and some good exercise! If you want a marble effect stop kneading when your color is slightly mixed and it will look marbled. To color your fondant in this method, you will use your paste or gel coloring, same as we suggested for coloring icing. Use a toothpick or tip of a table knife to scoop out a small bit of coloring. Add to your white icing and knead until color is well blended. This may take a few minutes and some good exercise! ~ Plastic gloves come in handy here so your fingers don't turn colors as well! Sprinkle your counter or mat with powdered sugar (or cornstarch) we prefer powdered sugar. You can use your kitchen counter or there is a fondant mat that shows you how big to roll your circle depending on the size of your cake. You want your circle to be larger than your cake so you can cut off the excess. You'd rather have too much too cut off then not enough to cover. Roll fondant out. You want it to be about 1/8 or 1/4 inch thick or about as thick as a nickel. With your hands or with your rolling pin place your rolled circle on top of your frosted cake. Smooth top flat with your hand starting in the middle and working toward edges. This lets the air out. We went a little overboard with the amount of fondant for this picture you really don't need this much excess! Move along the edges smoothing as you go. 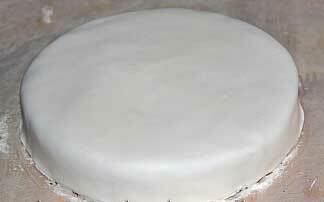 Bubbles often occur while rolling or smoothing on the cake. You can easily pop them with a sewing pin and smooth out. Cut excess with a knife or pizza cutter close to the bottom edge. Move your covered cake to your board or serving platter. You can add a fondant ribbon strip to your bottom edge or pipe a border to finish the edges. Roll circle and turn to form an even circle. 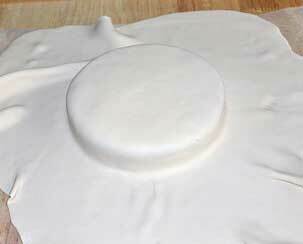 Don't flip circle over to other side as you would other dough when cooking. Just continue to turn circle until it is the desired shape and thickness. Save your excess pieces you cut off and make decorations for your cake or save for another day. Place in ziploc baggie and store at room temperature. 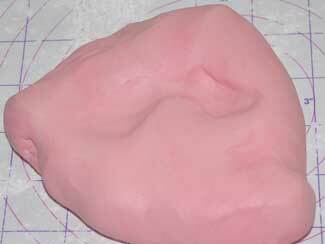 There are so many things you can do with fondant that it may be hard to determine what to do! 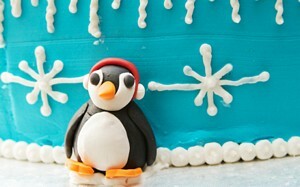 We're going to narrow down some easy and fun fondant decorations that you can create. You'll still need to put your cake together yourself but we'll get you started. 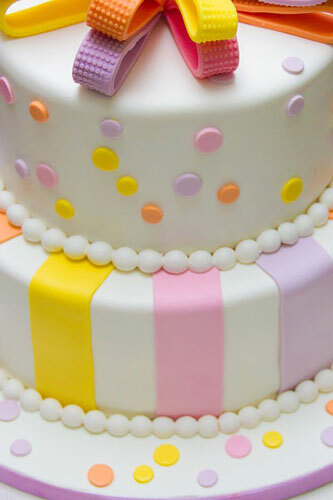 Stripes are a fun way to decorate your fondant cake. 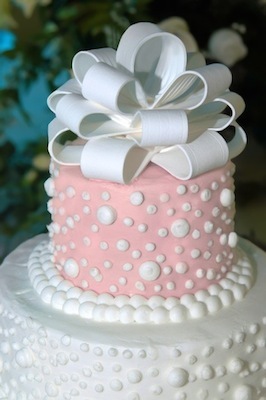 Cut strips with a ribbon cutter or pizza cutter and add to your cake along the edges. You can use all one color or a combination of colors for a fun look. Add a bow or writing on the top to finish it off. This design has a lot of our ideas below, dots, figures, and stripes. Cookie cutter circles work great for dots. 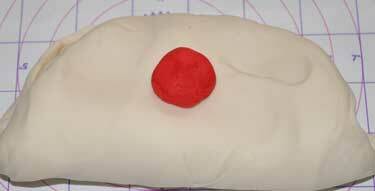 Cut different size circles out of one color or many different colors of fondant. Apply to your fondant covered cake with a wet finger. Any size or shape cookie cutters can be used to decorate your fondant. Try squares, autumn leaves, hearts or holiday decorations cut out of colored fondant. You can add more affects to each decoration if needed. Apply your designs in whatever fashion you'd like. 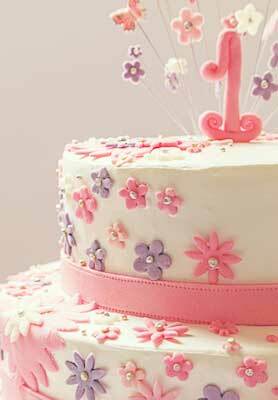 Fondant flowers can be created easily with cookie cutters or molds. Stack several size flowers for a 3D look or add edible pearls in the center of the flower. 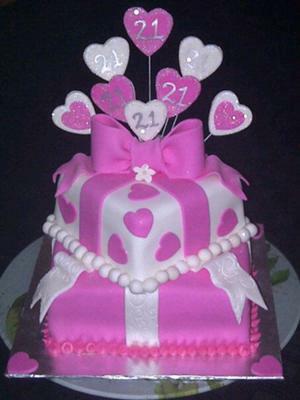 A fondant figure can be the center of the whole design. 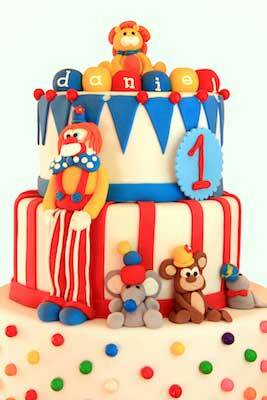 Depending on whether you created a person with a theme or an animal in the jungle, the figures make the whole cake. 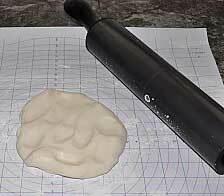 You can buy textured mats or rolling pins that leave a pattern on top of your fondant. 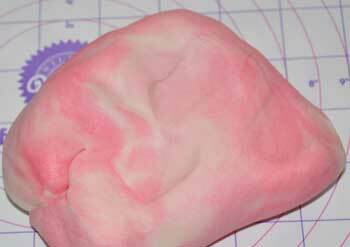 An easy way to create an elegant look to your fondant. Add a bow and some roses for an elegant look or add a bow to the center like you would a present. 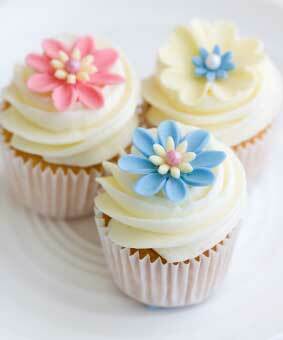 If your icing is too hard to work with you can microwave it for 5-10 seconds and it will soften up. Be careful of hot spots however. You can also place shortening on your hands to knead your dough. If it is too soft knead small amounts of powdered sugar into it on a cornstarch sprinkled counter. Always cover your icing when not using it so it won't dry out. Now check out how to make your own fondant. Leave working with fondant and see more cakes ideas.